The package handling industry, specifically baggage transport, is incredibly abrasive. Heavy conveyed materials and belt lacing cause continuous high-friction contact on sidewalls and slider beds during operation. This can dramatically reduce belt life and increase wear and tear on slider beds. DuraSurf™ STS is the perfect solution to these common issues. DuraSurf™ STS is a UHMW-PE product that is applied directly to the slider bed or sidewall to provide a virtually maintenance free, low-friction surface for belts and conveyed materials to glide on. DuraSurf™ STS protects slider beds, reduces maintenance time, provides energy savings, dramatically extends belt life, improves package flow, and cuts down static electricity. 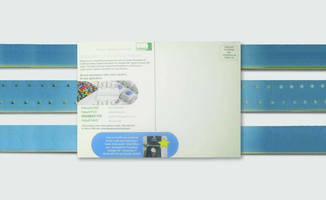 DuraSurf™ STS provides these cost-effective benefits and is easily installed with no special tools needed. 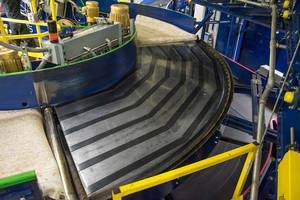 PVC Conveyor Belt is temperature resistant up to 194°F. 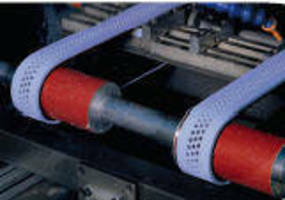 Incline Conveyor Accessory optimizes capacity, belt life.